Access to the official conference web site and community, 24×7. Real-time, online participation in keynotes, features, papers, and discussions. Access the conference papers and proceedings. Recordings of all live sessions. Opportunities for meeting and interacting with presenters & colleagues. Sharing background and professional contact information with colleagues. Participation in on-demand discussions and other networking activities. Discounted opportunities for other TCC sponsored faculty development events. Send email to Sharon Fowler <fowlers@hawaii.edu> from your @hawaii.edu email address requesting registration information. SITE LICENSES. A group registration fee is available for an unlimited number of participants from a single campus or system. Contact Sharon Fowler to register your group. <fowlers@hawaii.edu>. VENUE. 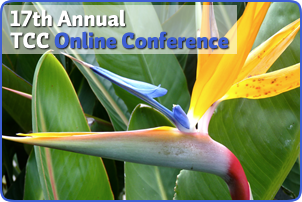 This conference is held entirely online using a web browser for access to content and technology services. A computer system with headphones and microphone as well as broadband Internet access is highly recommended. THEME. TCC offers refereed papers and general presentations on emerging technologies and current practices, distance learning, online communities and collaboration, social networking, and best choices of adapting instructional technology in teaching and learning. Regional speakers will be scheduled at 1400 local time in their respective regions. This event is produced in partnership between TCCHawaii.org, the University of Hawai’i at Manoa, Educational Technology Department, College of Education, and LearningTimes.org.